New Bridge At Nine Elms? asbo	Topical Stuff and Links - AKA The Academy Blog	Development, Topical Stuff and Links - AKA The Academy Blog	Comments Off on New Bridge At Nine Elms? Following on from the success of the Millennium Bridge, pedestrian and cycle bridges are planned further west — between Nine Elms and Pimlico and between Battersea and Chelsea Harbour. 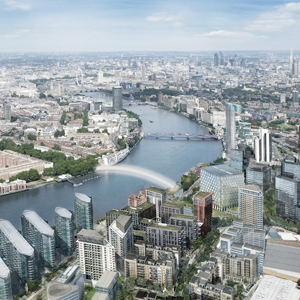 An international design competition will be launched in the autumn for the Nine Elms-Pimlico bridge. On the northern side, the bridge will emerge by St George’s Square — Pimlico’s poshest address — and give a fillip to the surrounding area, which has failed to command the status of posh Cheyne Walk, further west. Potentially, the new bridge could open up a route — and development corridor — to Sloane Square and the Chelsea heartland. However, the waterfront is already getting a facelift. Sprawling Churchill Gardens estate, with 1,600 homes in 32 blocks facing the Thames, has been designated a conservation area and part-listed, while Dolphin Square, the 1,250-apartment complex built in the Thirties, is being rejuvenated following a change of ownership, and long- tenanted flats are coming up for sale. The former Elephant on the River restaurant at 135 Grosvenor Road is being redeveloped into a modern, glass-clad block of eight apartments. Contact Richland Group on 020 7887 6349. And coming soon to a river-facing corner building at St George’s Square — actually a long and narrow rectangle of imposing cream-coloured stucco townhouses — is a refurbishment project bringing another 10 apartments. Wandsworth has already given planning consent for a car-free bridge between Battersea Park and Chelsea Harbour. Called the Diamond Jubilee Bridge, because it marks the place where Queen boarded the Royal Barge during her 60-year celebrations last summer, it will run alongside the listed railway bridge carrying trains from Clapham Junction to Imperial Wharf, where a new station has been built as part of the fashionable riverside housing estate. 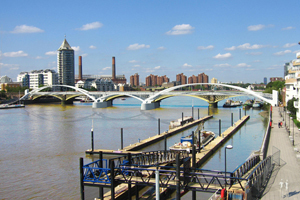 Hammersmith & Fulham council is expected to give the bridge the green light in September 2013. Cycling initiatives backed by Mayor Boris Johnson have encouraged support for car-free bridges. According to Transport for London, bicycles now outnumber cars on Thames bridges during morning and evening peak periods. However, elsewhere in London, new road bridges are set to make life easier for car-driving commuters, particularly in born-again Docklands, where giant regeneration schemes such as Silvertown Quays are creating new districts and tens of thousands of new homes.